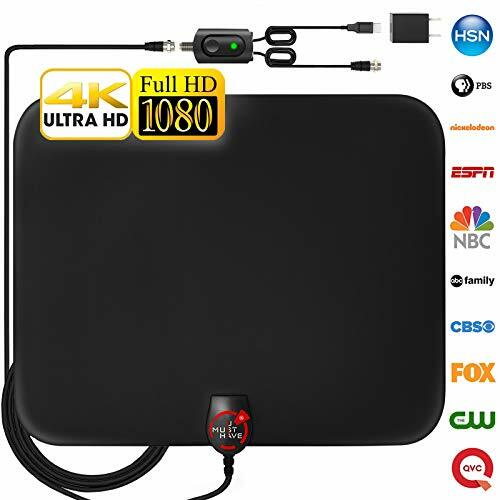 ⭐FULL HD CRYSTAL-CLEAR TV & HD SOUND QUALITY: Our smart tv antenna adopt upgraded Powerful 2019 Amplifier Signal Booster with built-in Smart IC Chip Next generation & Crystal Clear Filter Technology to picks up signals within 60-120 miles range depends from the area. The new technology filters out cellular and FM signals resulting in clearer picture, low noise and access to more free broadcast TV signals with enhanced gain, range and frequency performance. 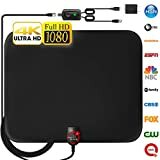 ⭐UP TO 60-120 MILES RANGE: The indoor HDTV antenna can reach up to 60-120 miles range depends from the area and can be placed almost anywhere in your Home. Digital antenna constantly scans for new channels as they're made available for broadcast. Hang the indoor antenna on a window or wall or better position where owns better reception of your House. VERY IMPORTANT: If a signal cannot be received with the amplifier, remove the antenna amplifier and try again. ⭐SATISFACTION GUARANTEED - Our team of professionals is constantly working to make you happier. We provide technical support for customers 24/7, If you have any questions or issues about your purchase, please feel free to reach us directly to us and we will gladly assist you at any time!! We are confident in the quality of our product and give you LIFETIME WARRANTY and great customer support. Click "BUY IT NOW" and ENJOY QUALITY OF OUR NEW TV ANTENNA!